The National Hajj Commission of Nigeria (NAHCON ) on Sunday said no fewer than 25 per cent of its officials would sacrifice their Hajj rites in order to serve pilgrims better. Mohammed assured of the commission’s commitment toward making this year’s operation a seamless one, adding that all measures had been put in place to ensure that the pilgrims enjoyed the best service. The NAHCON boss, therefore, urged all intending pilgrims to make good use of the officials’ sacrifice in order to achieve good Hajj performance. He said that despite the unprecedented increase in the 2017 Hajj fares, over 60,000 pilgrims had completed payment of their fares through various State Pilgrims Boards and Agencies. The NAHCON boss also said that over 19, 000 intending pilgrims that would perform Hajj through Private Tour Operators had paid their Hajj fares. He appealed to the intending pilgrims to be patient and understand with Hajj officials “because they are all human beings like you”. “About 25 per cent of this year’s officials will sacrifice their Hajj rites while in the Holy land in order to attend to all the needs of the pilgrims. ” So far, 20,000 travel visas have been released by the Saudi Arabian Embassy in Nigeria. ” And in a matter of days, I believe that the embassy will make available all the visas, ” Mohammed said. Alhaji Sa’ad Abubakar III, the Sultan of Sokoto and President-General, Nigeria Supreme Council for Islamic Affairs (NSCIA), advised all Nigerian pilgrims to abide by Saudi Arabian rules and regulations and do everything in moderation. Abubakar, who was represented by the Emir of Bauchi, Alhaji Rilwanu Suleiman, also admonished the pilgrims to avoid carrying excessive luggage. ” Avoid groups that you don’t know, eat very well, don’t starve yourself because you want to come back with extra money, ” the Sultan said. 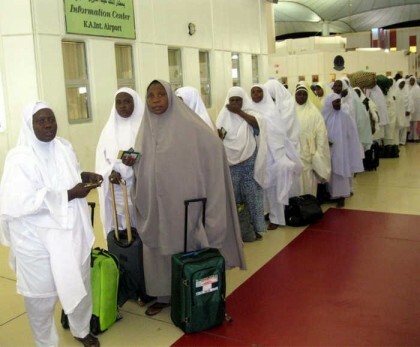 The News Agency of Nigeria (NAN) reports that no fewer than 500 intending pilgrims from the Federal Capital Territory (FCT) departed the Nnamdi Azikiwe International Airport in the inaugural flight to the Kingdom of Saudi Arabia.